The Eastern Massasauga has been extirpated from much of its historic range due to many anthropogenic threats. Can new research into the causes of decline of the species lead to its recovery? Will new conservation measures preserve the habitat that the species still occupies? Figure 1. Eastern Massasauga Rattlesnake (Sistrurus c. catenatus) in Ohio. Courtesy of James Chiucchi, 2007, FlickrCommons. CC BY 2.0. For many species, extinction due to anthropogenic causes is a looming threat. There are many threats that make survival difficult for the animals including habitat destruction, culling or hunting, prey items being killed due to pesticides or pollutants, non-native diseases, or competitors being introduced. For some species, the survival threat was overwhelming and caused their extinction. For others, like the Eastern Massasauga rattlesnake, there is still hope. Figure 3. Eastern Massasauga Rattlesnake Research. Image 1: Eastern massasauga numbers are being monitored across the midwest, as the species has critically declined. The U.S. Fish and Wildlife Service works to complete surveys of the rattlesnakes to better manage their habitats and populations. Image 2: To trap snakes, fences may be constructed to contain the snakes. The fences are temporary and guide the snakes to an area accessible by the researchers. Image 3: Because the massasauga is a poisonous reptile, precautions must be taken when in close contact. Tools such as this are used by wildlife biologists to collect the snakes. Image 4: An eastern massasauga rattlesnake captured from a survey is placed in a cloth bag for transport. While efforts to save this declining species have had some success, there is still much to be done. Preserving natural habitats as well as rehabilitating old historical habitats will create more spaces for the species to occupy, thus reducing the risk of a bottleneck effect.3 Educating the public not only about the rattlesnakes and their importance to the ecosystem, but also on how to react when one is discovered while camping, hiking, or on one’s own property could significantly reduce the risk of mortality due to human exposure and prevent humans from being bitten. Educational outreach may help to preserve this species and create a more positive reaction with the public when increased repatriation attempts are pursued. Figure 4. 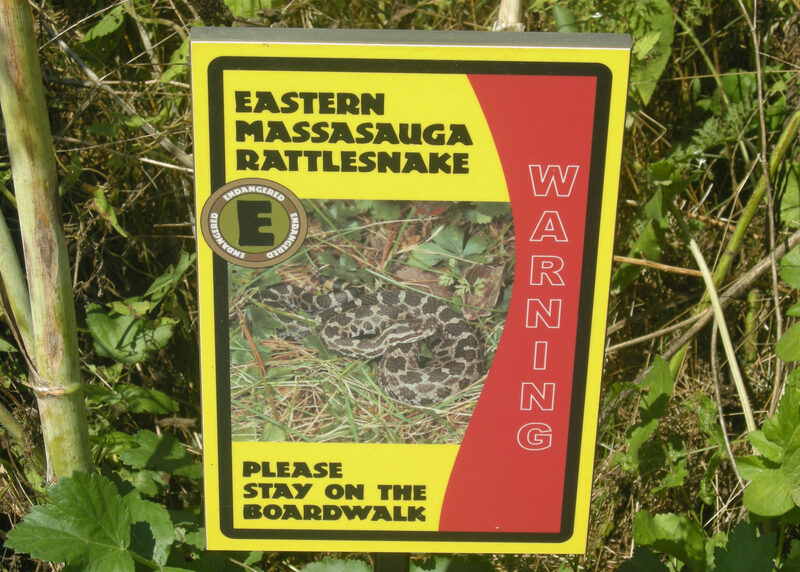 Eastern Massasauga Rattlesnake warning sign placed on a boardwalk in Cedar Bog Nature Preserve. Courtesy of Dakota Callaway, 2012, FlickrCommons. CC BY 2.0. Bailey, R. L., et al. (2011). 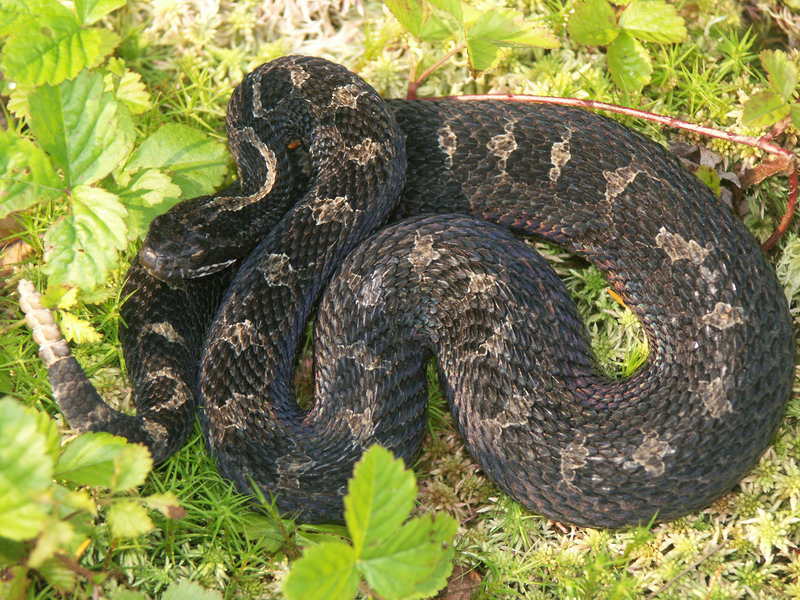 Survival of eastern massasauga rattlesnakes (Sistrurus catenatus catenatus) in Michigan. Herpetologica, 67(2):167-173. Chiucchi, J. E. & Gibbs, H. L. (2010). Similarity of contemporary and historical gene flow among highly fragmented populations of an endangered rattlesnake. Molecular Ecology, 19(24):5345-5358. Gibbs, H. L. & Chiucchi, J. E. (2012). Inbreeding, body condition, and heterozygosity-fitness correlations in isolated population of the endangered eastern massasauga rattlesnake. Conservation Genetics, 13(4):1133-1143. Harvey, D. S. & Weatherhead, P. J. (2006). A test of the hierarchical model of habitat selection using eastern massasauga rattlesnakes (Sistrurus c. catenatus). Biological Conservation, 130(2):206-216. Jones, P. C., et al. (2012). Range-wide analysis of eastern massasauga survivorship. The Journal of Wildlife Management, 76(8):1576-1586. King, R., et al. (2004). A repatriation study of the eastern massasauga (Sistrurus catenatus catenatus) in Wisconsin. Herpetologica, 60(4):429-437. Shepard, D. B., et al. (2008). Reptile road mortality around an oasis in the Illinois corn desert with emphasis on the endangered eastern massasauga. Copeia, (2):350-359.Shoemaker, K. T. & Gibbs, J. P. (2010). Evaluating Basking-Habitat Deficiency in the Threatened Eastern Massasauga Rattlesnake. The Journal of Wildlife Management, 74(3):504-513. Szymanski, J., et al. (2016). 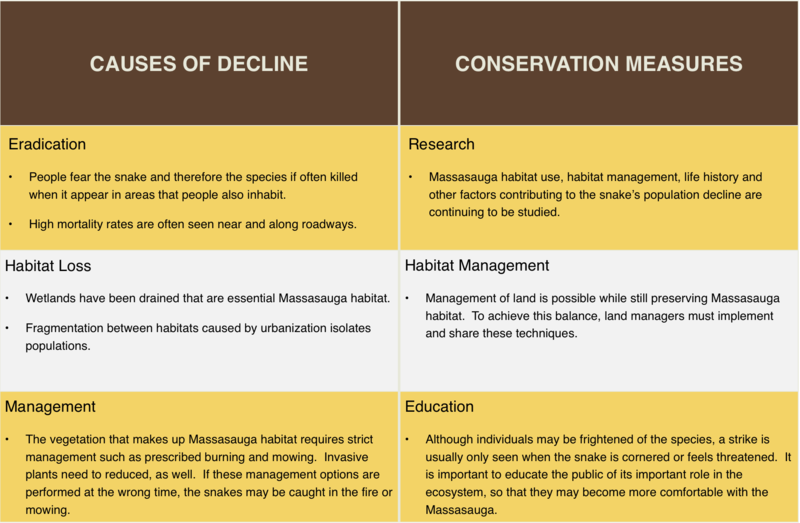 Species status assessment for the Eastern Massasauga Rattlesnake (Sistrurus catenatus). U.S. Fish and Wildlife Services, Endangered Species Division. Retrieved from https://www.fws.gov/midwest/Endangered/reptiles/eama/pdf/SSAFinalV2July2016EMR.pdf. Weatherhead, P. J. & Prior, K. A. (1992). Preliminary observations of habitat use and movements of the eastern massasauga rattlesnake (Sistrurus c. catenatus). Journal of Herpetology, 26(4):447-452. Weatherhead, P. J., et al. (2009). Diet of Sistrurus catenatus in Ontario and Ohio: Effects of Body Size and Habitat. Journal of Herpetology, 43(4):693-697. Callaway, Dakota. (2012). [Photograph of Eastern Massasauga Rattlesnake Warning Sign in Cedar Bog State Nature Preserve]. Retrieved from FlickrCommons. CC BY 2.0. Chiucchi, James. (2007). [Photograph of Eastern Massasauga Rattlesnake]. Retrieved from FlickrCommons. CC BY 2.0. Kucera, Abbey, United States Fish and Wildlife Service. (2016). [Photograph of Eastern Massasauga, #1 in Gallery]. Retrieved from FlickrCommons. CC BY 2.0. Kucera, Abbey, United States Fish and Wildlife Service. (2016). [Photograph of temporary fence trap, #2 in Gallery]. Retrieved from FlickrCommons. CC BY 2.0. Kucera, Abbey, United States Fish and Wildlife Service. (2016). [Photograph of special handling tool, #3 in Gallery]. Retrieved from FlickrCommons. CC BY 2.0. Kucera, Abbey, United States Fish and Wildlife Service. (2016). [Photograph of snake in snake bag, #4 in Gallery]. Retrieved from FlickrCommons. CC BY 2.0.